From Amazon: Ten years ago Kate Winters’ parents were taken by the High Council’s wardens to help with the country’s war effort. Now the wardens are back...and prisoners, including Kate's uncle Artemis, are taken south on the terrifying Night Train. Kate and her friend Edgar are hunted by a far more dangerous enemy. Silas Dane – the High Council’s most feared man – recognises Kate as one of the Skilled; a rare group of people able to see through the veil between the living and the dead. 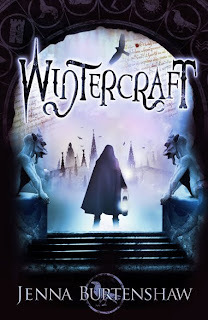 His spirit was damaged by the High Council’s experiments into the veil, and he’s convinced that Kate can undo the damage and allow him to find peace.The knowledge Kate needs lies within Wintercraft – a book thought to be hidden deep beneath the graveyard city of Fume. But the Night of Souls, when the veil between life and death is at its thinnest, is just days away and the High Council have their own sinister plans for Kate and Wintercraft. I'm really looking forward to this one too, and I *love* that cover. Great choice for the debut author challenge! I've been excited about this book for ages.. I can't wait for it! I love the cover too, it's brilliant! Definitely. I agree 100%. I am so reading this for my Debut Author Challenge too and the cover is gorgeous. Ooh nice, I've never heard of this one! Thanks for the pick. Ooh, I've never heard of this one before either. Though, it sounds fab!